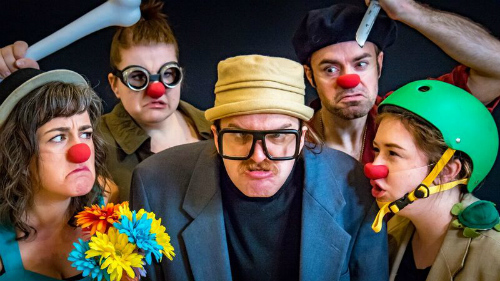 The Truth* (playing at the 2018 Toronto Fringe Festival) is a clown play about colonialism. A vast new territory opens up, rich in resources and readily-accessible. We meet the rulers of the four nations jockeying for position, and we explore their motivations and histories, and we get to see what happens when these interests collide. The result is genre-straddling, drawing on tropes from children’s theatre, melodrama, propaganda and patriotic history in order to suggest new perspectives on old stories. A Muse Zoo is a strong clown-and-mime company, who shine especially bright when they get to work as a collective and play with theatrical conceits: much of their best business involves various combinations of props, wigs, entrances and exits, reaching particular heights during the introduction to “Gorgonzolia”, which is France in French drag. Sarah Brizek also got a standout turn as the king of a moodily-lit subterranean kingdom. But I also found that this format got repetitive: most of the show gets spent on introducing us to the four competing nations, two of which I found so unmemorable as concepts that spending ten minutes fleshing out each one struck me as overkill. This could be the rare case where replacing a developed scene with a 30-second monologue — telling, rather than showing — might have done the piece a favour. I’m also not totally sold on the framing device, in which a grumpy history instructor sets out to teach the audience a lesson. There’s nothing wrong with the acting, but I found that returning to this device again and again doesn’t really help tell the story, and the treatment is so on-the-nose that the show’s climax gets telegraphed from the opening scene. But for all my quibbles, these people are great clowns who’ve laced the piece with creative ideas and beautiful, dancerly movement. There’s a lot to smile about in The Truth*, and the scenes which work, work so well. Fans of Morro and Jasp (and who isn’t a fan of Morro and Jasp?) will find a lot to like here. Cast photo by Michael Bryant.